Temporary blindness, also known as fleeting blindness, is a temporary loss of vision. People often find temporary blindness to be a problematic issue, especially when its onset is sudden. Vision problems are common in today’s day and age. This shouldn’t come as a surprise, especially with the increasing amount of people gluing their eyes to television screens, laptops, and phones. So what happens when you lose your sight temporarily? If your vision is suddenly impaired, you can place yourself and others in danger—especially when engaging in an activity that requires vision (i.e. driving). Episodic blindness: Episodic blindness or amaurosis fugax is a temporary loss of vision that usually occurs in one eye. It is a rare issue that is caused by a lack of blood flow to the eye, and it can last anywhere from several seconds to several minutes. Episodic blindness could be a sign of a more serious condition, such as a stroke. People often describe it as seeing a shade or curtain pulled down over one eye. It’s generally not painful and people can still see out of the other eye. Flash blindness: Another common form of temporary blindness is flash blindness, which is blindness caused by a bright flash of light. For example, a bright camera flash, or transitioning from a dark room to the sunny outdoors can lead to flash blindness. Flash blindness is caused when retina pigments that are responsible for recognizing light become oversaturated. Chemicals: Many chemicals can cause temporary blindness when sprayed in the eyes (i.e. pepper spray, mace, or even cleaning products). Conversion disorder: If you are experiencing severe psychological or emotional stress, you may experience a conversion disorder. This is when the brain essentially turns psychological issues into physical symptoms (i.e. blindness). Heart complications: Heart problems can cause temporary blindness. For example, a condition called aortic dissection occurs when a tear in the wall of the aorta causes blood to flow into the aorta’s walls. This alters properties of the blood that flows throughout the rest of the body. If the wrong amount of oxygen reaches the areas of the brain that control vision, temporary vision loss can occur. Cranial pressure: Fluids that build up around the membranes in the skull can increase pressure against nerve endings or the optical canal, leading to temporary blindness. Sickle cell disease: This is an inherited blood condition that increases the risk of eye conditions. Plants: Plants that contain alkaloids and glycosides can reduce vision or cause general blindness if ingested. Chronic angle-closure glaucoma: This condition causes an abrupt rise in pressure, usually is one of the eyes. A doctor will examine your eyes and conduct tests to identify the underlying cause of your temporary blindness. An ultrasound, for example, can show if there is narrowing or blockages in your neck while an echocardiogram will show how well your heart muscle is pumping. Treatment depends on the cause, but blood thinners or aspirin may be prescribed to prevent blood clots. If high blood pressure or cholesterol levels are underlying causes, your doctor will likely put you on a healthy diet plan. Finally, smokers who experience temporary vision loss should stop smoking immediately in case surgery is needed to remove blockages in the carotid artery. Almost anyone can experience temporary or episodic blindness, but a healthy lifestyle can help prevent it—especially if the underlying cause of your temporary vision loss is a heart complication. Aim to maintain a healthy weight, exercise and follow a nutritious diet. Find ways to manage stress and limit alcohol consumption. It’s also a good idea to take care of your eyesight to avoid vision problems in general. Wash your eyes: Try washing your eyes with natural eyewash made from the herbal powder triphala churna. Soak triphala churna in water overnight. In the morning and right before bed, strain the liquid and wash your eyes with it. This eyewash will relieve stress in your eyes. Massage overworked eyes: If you’re working long hours in front of a computer screen, this is a great exercise for you. Begin by holding your eyebrows between your thumb and index finger, so that the thumb is above the eyebrow and index finger directly below it. Gently press and straighten your eyebrows. Now, take your thumb and roll it around your eye ball. Repeat this exercise once every three to four hours to improve the circulation around the eyes to help your eyes recover from fatigue. 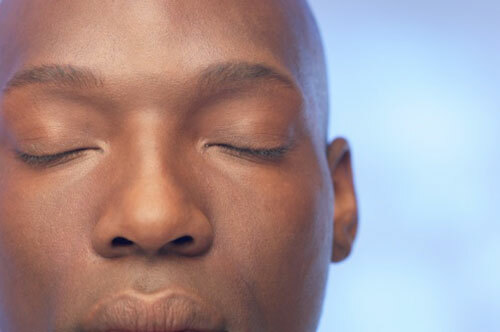 Stimulate your eye muscles: This technique should be done every morning. Upon waking up, wash your face with cool water. Then fill your mouth with water, shut your eyes and splash water onto your eyes. It will stimulate the eye muscles because of the pressure wielded by the water in your mouth. Improve your vision with palming: This ancient Ayurveda treatment involves covering your closed eyes with your palm. Start by rubbing the palms of both your hands for 30 seconds and then place them gently over your closed eyes. Hold this position for about a minute and then slowly open your eyes. Don’t look directly at the light after performing this technique; allow your eyes to gradually acclimatize to the light. Get some sleep: Sleep allows your body to rest and heal and gives your eyes relief from strain and bright lights. Experts believe that meditating or praying 10 minutes before bed is a good way to ensure sound sleep. Blink: Blinking is a natural way to renew the moisture in your eyes and give them relief. Try blinking every five to six seconds. First, look to your right as far as you can for three to five seconds. Next, look to the left as far as you can for another three to five seconds. Rest for a few seconds and repeat. Look up as far as you can for three to five seconds and then look down as far as possible for three to five seconds. Rest for a few seconds and repeat. Roll your eyes clockwise and then counter clockwise. Rest for a few seconds and repeat several more times. Be sure to roll your eyes slowly—it should take at least three seconds for your eyes to roll in a full circle. Take a pen and hold it in front of you at arm’s length. Focus on the tip of the pen for three to five seconds, and then shift your focus to a different object, further from the pen. Focus for another three to five seconds. The greater the distance between the pen and the second object, the better. A healthy diet is a great complement to your eye exercises and will keep your vision sharp. Dry fruits and nuts: Raisins, figs and almonds are great elixirs for the eyes. Try this home remedy, which will help your eyes cope with your day-to-day activities: Soak six to 10 almonds, 15 raisins and two figs overnight in water. Eat them on an empty stomach in the morning. The fiber and vitamins in these fruits will speed up the digestive process and help get rid of toxins, thus resolving eye-related problems. Copper-rich foods: One of the benefits of copper as a micronutrient is that it contains potent antibacterial properties. Experts recommend drinking one liter of water, stored overnight in a copper vessel. This provides healing properties to the eyes and other vital organs. “What is Temporary Blindness?” wiseGEEKweb site, http://www.wisegeekhealth.com/what-is-temporary-blindness.htm, last accessed October 21, 2015. Chavis, J., “Causes of Temporary Blindness,” eHow web site, http://www.ehow.com/facts_4909631_some-causes-temporary-blindness.html, last accessed October 21, 2015. Sampath, P., “8 natural remedies for better eyesight that actually work!” TheHealthSite web site, February 4, 2015; http://www.thehealthsite.com/diseases-conditions/natural-remedies-for-better-eyesight/. “How to Improve Vision Naturally,” Healthy-Holistic-Living.com, http://www.healthy-holistic-living.com/improve-vision-naturally.html, last accessed October 21, 2015. “Vision Loss, Temporary (Amaurosis Fugax),” Summit Medical Group web site, http://www.summitmedicalgroup.com/library/adult_health/sha_amaurosis_fugax/, last accessed October 21, 2015.